In Major League Baseball (MLB), records play an integral part in evaluating a player's impact on the sport. Holding a career record almost guarantees a player eventual entry into the Baseball Hall of Fame because it represents both longevity and consistency over a long period of time. In 1994, San Diego Padres right fielder Tony Gwynn set the modern record for highest single-season batting average, hitting .394 with 64 RBIs and 12 home runs. 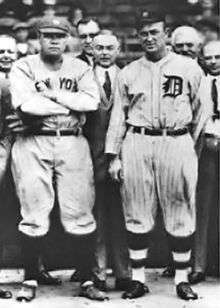 Babe Ruth (left) holds the record for highest slugging percentage, OPS and runs created, while Ty Cobb (right) holds the records for highest batting average and most steals of home. 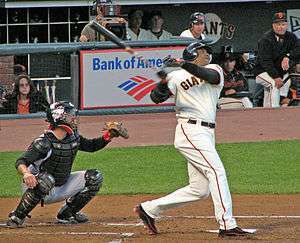 Barry Bonds holds the most hitting records with ten, most notably the career home run and single-season home run records. Ichiro Suzuki collected 262 hits in 2004, breaking George Sisler's 84-year-old record for most hits in a season. 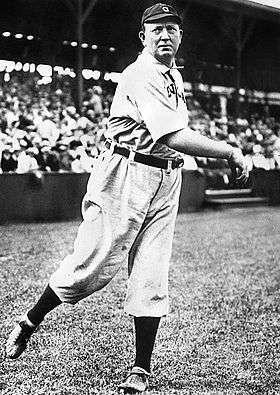 Cy Young, the Major League record holder for most career wins, losses, innings pitched, and complete games. Most wins Jim Bagby, Sr. Most hits in a nine-inning game: 7 by Wilbert Robinson, June 10, 1892, and Rennie Stennett, September 16, 1975. Most hits in an extra-inning game: 9, Johnny Burnett, July 10, 1932. 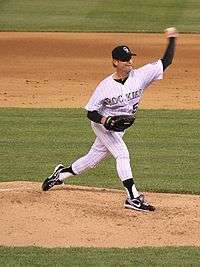 Most total bases in a nine-inning game: 19 (4 home runs, a double and a single), Shawn Green, May 23, 2002. Most caught no hitters: 4, Jason Varitek, May 19, 2008 and Carlos Ruiz, July 25, 2015. Note: Pre-1950 stolen-base data is incomplete; career leaders shown from 1950 to present. Both of Ruiz's no-hitters were by Roy Halladay; the second was in Game 1 of the National League Division Series, Halladay's first career postseason start. In 1914, Yankees catcher Les Nunamaker threw out three runners in the same inning. Most Consecutive Games Played: 2,632, Cal Ripken, Jr.
↑ Prior to 1898, a player was credited with a stolen base if he took an extra base on a base hit by another player. For example, a baserunner is on first base and the batter singles to right field. If the baserunner reaches second base, then proceeds to take third, he would be credited with a stolen base. The single-season record under modern rules is 130 by Rickey Henderson in 1982. ↑ Even though Hershiser's 59 consecutive scoreless innings occurred completely within the 1988 season, other pitchers have had streaks spanning more than one season. Thus, it is necessary to put the record over a career. ↑ "Career Leaders & Records for Singles". Baseball-Reference.com. Retrieved July 25, 2012. ↑ "Career Leaders & Records for Doubles". Baseball-Reference.com. Retrieved July 25, 2012. ↑ "Career Leaders & Records for Triples". Baseball-Reference.com. Retrieved July 25, 2012. ↑ "Career Leaders & Records for Home Runs". Baseball-Reference.com. Retrieved July 25, 2012. ↑ "Career Leaders & Records for Runs Batted In". Baseball-Reference.com. Retrieved July 25, 2012. ↑ "Career Leaders & Records for Hits". Baseball-Reference.com. Retrieved July 25, 2012. ↑ "Career Leaders & Records for Runs Scored". Baseball-Reference.com. Retrieved July 25, 2012. ↑ "Career Leaders & Records for On-Base%". Baseball-Reference.com. Retrieved July 25, 2012. ↑ "Career Leaders & Records for Stolen Bases". Baseball-Reference.com. Retrieved July 25, 2012. ↑ "Career Leaders & Records for Slugging %". Baseball-Reference.com. Retrieved July 25, 2012. ↑ "Career Leaders & Records for On-Base Plus Slugging". Baseball-Reference.com. Retrieved July 25, 2012. ↑ "Career Leaders & Records for Bases on Balls". Baseball-Reference.com. Retrieved July 25, 2012. ↑ "Career Leaders & Records for Intentional Bases on Balls". Baseball-Reference.com. Retrieved July 25, 2012. ↑ "Career Leaders & Records for Strikeouts". Baseball-Reference.com. Retrieved July 25, 2012. ↑ "Career Leaders & Records for At Bats". Baseball-Reference.com. Retrieved July 25, 2012. ↑ "Career Leaders & Records for Total Bases". Baseball-Reference.com. Retrieved July 25, 2012. ↑ "Career Leaders & Records for Runs Created". Baseball-Reference.com. Retrieved July 25, 2012. ↑ "Career Leaders & Records for Games Played". Baseball-Reference.com. Retrieved July 25, 2012. ↑ "Single-Season Leaders & Records for Batting average". Baseball-Reference.com. Retrieved July 25, 2012. ↑ "Single-Season Leaders & Records for Doubles". Baseball-Reference.com. Retrieved July 25, 2012. ↑ "Single-Season Leaders & Records for Triples". Baseball-Reference.com. Retrieved July 25, 2012. ↑ "Single-Season Leaders & Records for Runs Batted In". Baseball-Reference.com. Retrieved July 25, 2012. ↑ "Single-Season Leaders & Records for Hits". Baseball-Reference.com. Retrieved July 25, 2012. ↑ "Single-Season Leaders & Records for Runs Scored". Baseball-Reference.com. Retrieved July 25, 2012. ↑ "Single-Season Leaders & Records for On-Base%". Baseball-Reference.com. Retrieved July 27, 2012. ↑ "Single-Season Leaders & Records for Stolen Bases". Baseball-Reference.com. Retrieved July 25, 2012. ↑ "Single-Season Leaders & Records for Slugging %". Baseball-Reference.com. Retrieved July 27, 2012. ↑ "Single-Season Leaders & Records for On-Base Plus Slugging". Baseball-Reference.com. Retrieved July 27, 2012. ↑ "Single-Season Leaders & Records for Bases on Balls". Baseball-Reference.com. Retrieved July 27, 2012. ↑ "Single-Season Leaders & Records for Intentional Bases on Balls". Baseball-Reference.com. Retrieved July 27, 2012. ↑ "Single-Season Leaders & Records for Total Bases". Baseball-Reference.com. Retrieved July 27, 2012. ↑ "Single-Season Leaders & Records for At Bats". Baseball-Reference.com. Retrieved July 27, 2012. ↑ "Strikeout Records by Pitchers including Career Strikeouts, Single Season Strikeouts and Strikeouts in a Game Records, by Baseball Almanac".